So, I'm knee deep in my current cartooning project (see previous post) and I can't help but keep thinking about my last venture as a cartoonist. 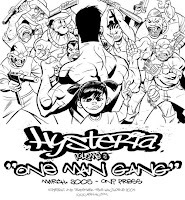 Hysteria: One Man Gang. OMG came out of two things. The desire to build on the Hysteria series I had started my career with and to give myself a huge artistic challenge. 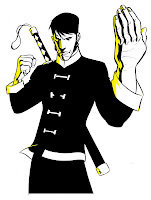 Namely, to make a one hundred page action scene that still built upon the characters. It actually proved to be a lot easier then I had expected, and at one point I even considered bumping it up to two hundred pages. I also found I could tell readers more about a characer by showing their decisions while in action then I could have with talking heads. OMG was originally to be published as a graphic novel by Oni Press, where it wasn't a great fit. 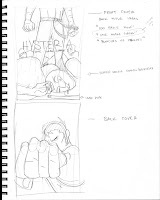 If I'm not mistaken this was before Scott Pilgrim, and Oni wasn't known for this kind of fight comic type of material. I later jumped to Image, where it worked less. I won't go into details now, but I'm mentioning it now because I want to set the stage for some of these images I'm sharing. You'll see some of them have publishing information, and knowing the history will make it easy to follow the article. I'm going to talk first about how we tried to promote this book. I know it's an odd place to begin an article about a creative work, but I feel it's fitting because SO much art and thought went into trying to get this book off the ground. I felt, and still feel, that this book had huge potential if I could build an audience for it. Hysteria had failed as a self published series, and the first volume at Oni had done OK, but not Good. For this to work, we needed support. To gain that, I needed to give fans something special. Something that DESERVED their support. When we started to do some grass roots marketing for this book I had already started the book it's self. I had been working on the book when it was at Oni, and when I switched to Image I already had a good bit of the book done and was ready to switch over to doing some promo work. I went all out with this stuff. You have to understand, I loved this book and wanted to show it to the world. Doing these promo pieces was like taking kid's photos. I wanted to make comic fans fall for this book. My partner Erik Swanson ( who lettered, and toned the book) and I tried like hell to sell this book. I designed a series of mailers that I sent to retailers, as well as free promotional posters. Erik even went from store to store in LA and dropped off promo material with store owners, as well as discussing the book with them. I did the same here in Pennsylvania and New York. We showed these folks advanced previews of the books too. Anything to get them excited about the new series. I also made the rounds at conventions and handed out promo cards and free mini posters. I handed out a thousand posters, and a couple of thousand promo cards. Everyone that saw this thing loved it, but in the end the orders were very low. In the areas of the country we reached out to the orders were stronger then the areas we couldn't. I still believe if we could have reached farther, we could have made this work. I was also lucky enough to have friends willing to run ads in their books for Hysteria. Here's one that ran in a few Image books. I'm going to end Pt.I here. Stay tuned for more on my Magnificent Failure in a week. Funny we have the same name for our publishing. But my stuff's a little weirder. I read your story and I was touched. I'm glad u hung in there. We should connect and trade banners or whatever. Keep up the comics revolution! I think this is a great line of postings. This is honestly what I want to learn more about. Promoting books, how things could have been done differently, what things worked, what didn't, etc. More and more, these things are going to become key topics to have in place before the book gets printed or planned. Too many good books aren't ordered or heard about. Really, really looking forward to this line of postings. It may not end for a while, but hopefully I will find a way to do it. Yo, thanks! I appreciate the support. More then you know. Stay tuned to the blog for more on how this thing got derailed. Have you tried Desperado Publishing?? I can't see then walking away from a sweet deal like this.